Sligo Wear is one of those brands that offers the perfect blend of style and performance. 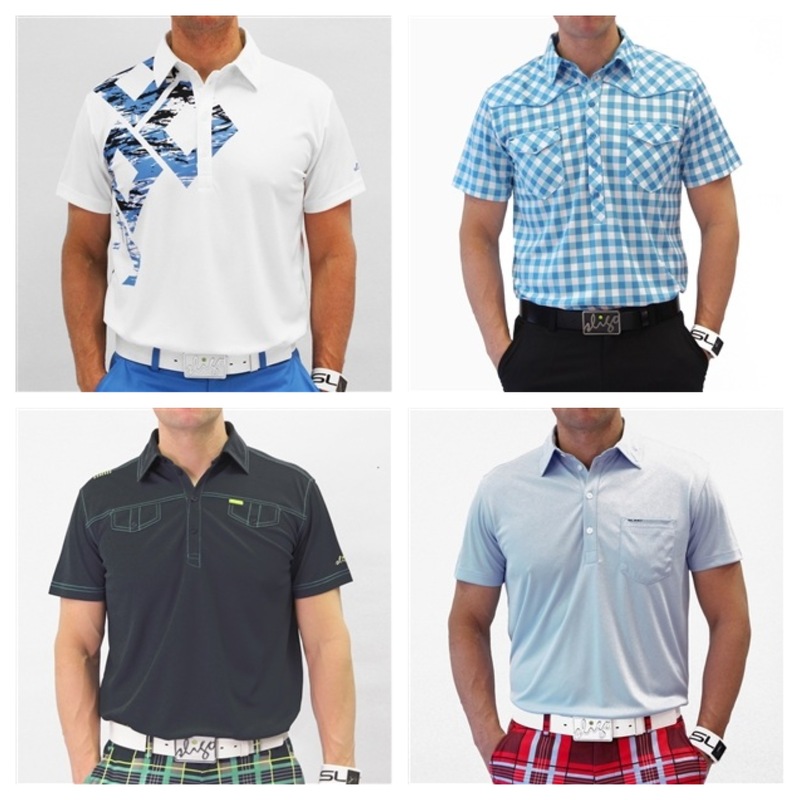 The Canadian brand burst onto the scene in 2004 and set out to redefine the “golf uniform”. Since then, they haven’t let off the accelerator, and their Spring 2013 (13A) Collection may be their best collection yet. Sligo Wear started leaking photos of the 13A Collection through social media at the beginning of the year. At that point it was clear that the new collection would fuse a high-octane color palette and trend-setting styles with hi-tech performance fabrics and modern fits–classic Sligo. Now that the collection has been released, I can safely say that the brand has something special going on this year. Brilliant blues, vibrant greens and electric reds (corals to be exact) dominate the collection. These bold colors are used throughout the collection in a variety of eye-catching shirts, shorts, pants and belts, and are balanced against grey, black and a unique color called iron blue (deep navy blue). The vibrant Sligo Wear 13A Collection color palette. Every once in a while a brand releases a collection that I look at and say, “I’ll take one of everything”, and that’s what Sligo has achieved with this latest collection. In other words, a lot of my money will be heading north of the border this golf season. 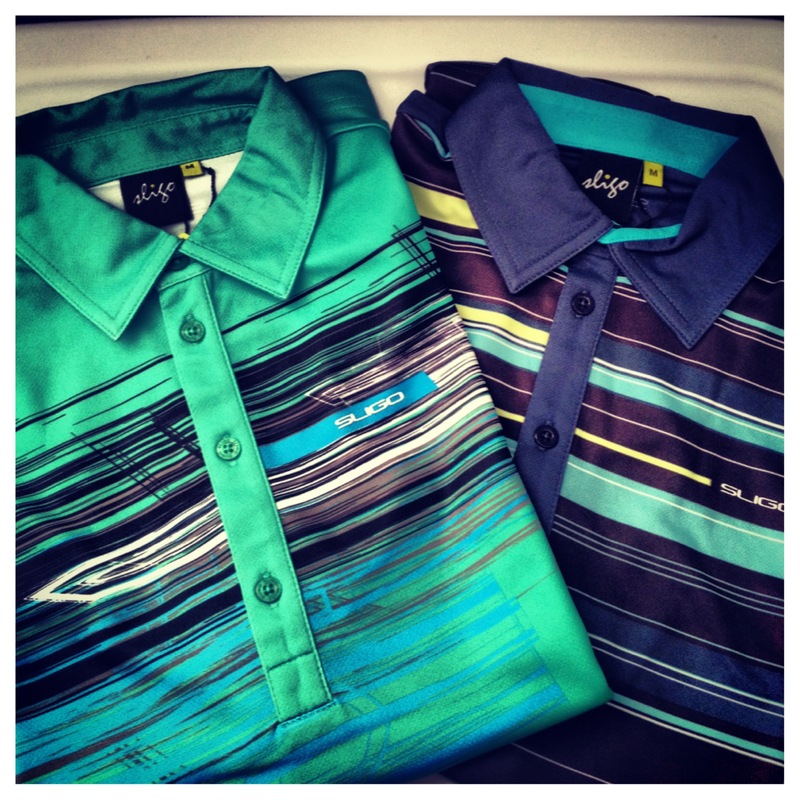 Check out any PGA Tour tournament and you’ll see that one of the hottest trends in golf style is bold stripes. Sligo, though, takes this to another level with the Ewan and the Harlow–two of my favorites from the 13A Collection that have already made their way into my closet. The Harlow features a creative mix of thin and thick stripes on the front of the shirt that actually gets more complex the more you look at it, and the hyper active blend of bright and dark streaks make the Ewan look more like an abstract piece of art than a golf shirt. A few of my other favorite shirts from the collection are the Haiden with the a distressed argyle pattern, the gingham-checked Yorkville and the retro-classic Ethan with faux chest pockets. Also, be sure to check out the Martin. I have one of the Martins from a previous collection and it is a highly versatile shirt. It is offered in a variety of colors that pair well with Sligo’s funky plaid shorts. Clockwise from Top Left: The distressed argyle pattern of the Haiden. The gingham-checked Yorkville. The retro-classic Ethan. The versatile Martin. Sligo shirts have a very modern, athletic fit. This means shorter and narrower sleeves and a more tapered fit through the body. I find that they run true to size, but if you prefer a more traditional fit, I would recommend sizing up. 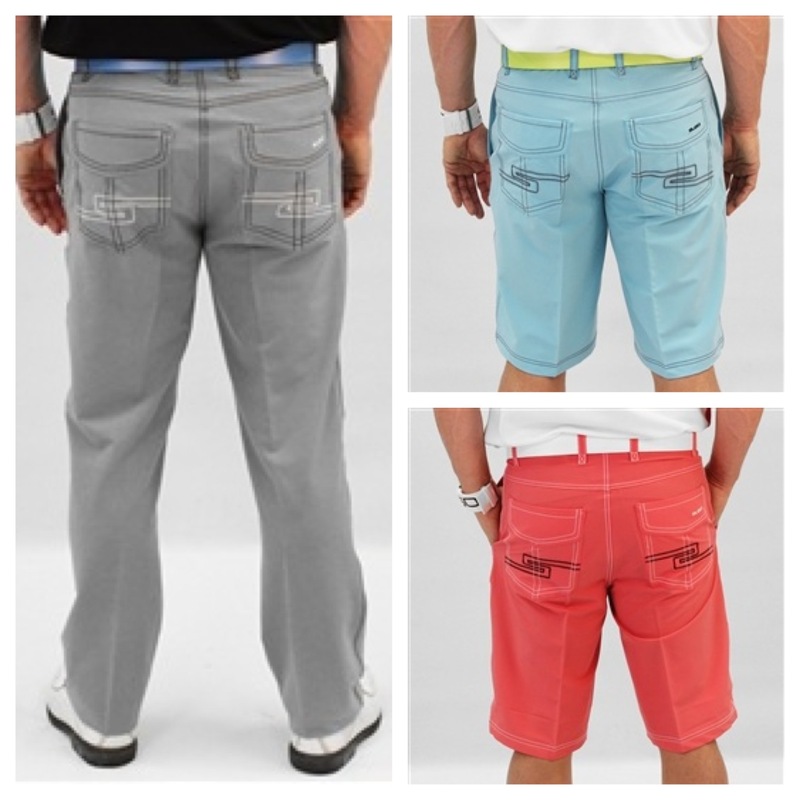 They are constructed of a high performance antimicrobial fabric which means even if your golf game stinks, you won’t. As great as the shirts from Sligo are, the pants, shorts and belts really tie everything together. Sligo offers four styles of pants and shorts in the 13A Collection–Solid, Plaid, Digitile and the Preston. Get Diggy with it: The unique design of the Digitile pants and shorts. While the Sligo plaids garner a lot attention due to their vibrant colors and edgy design (and rightfully so), the Digitile pants and shorts are truly unique. Plaids have become mainstream over the last few years as more brands have jumped on the bandwagon, but no other brand is doing a Digitile pattern. The inspiration for the Digitile design originated from a pattern of 14th century Moroccan tile. Who knew it would look so cool on a pair of pants or shorts? 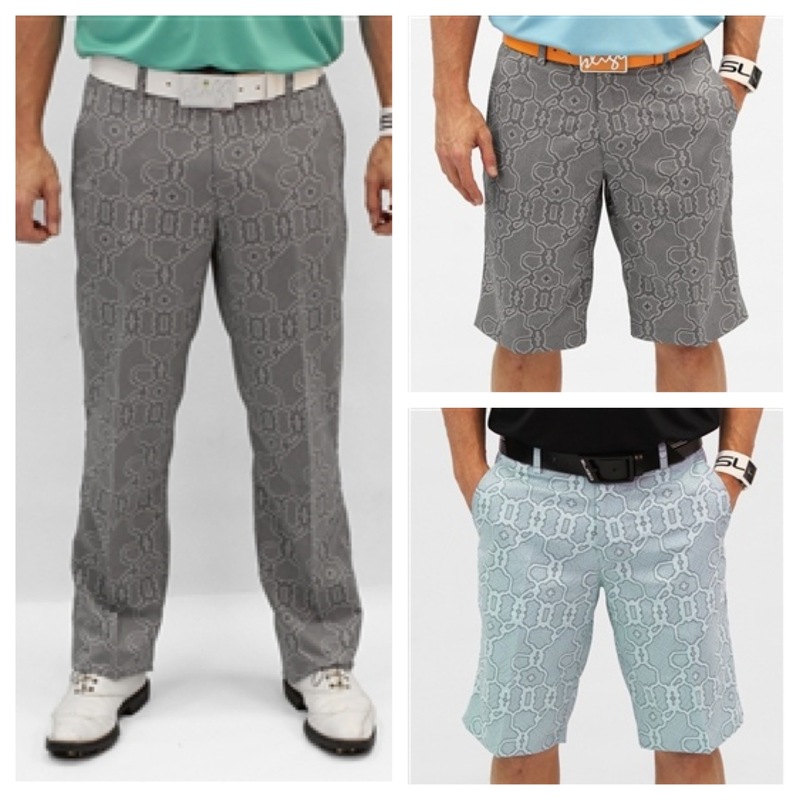 A pair of Digitile pants or shorts will certainly set you apart from your playing partners and generate some second looks in the clubhouse. The swagger-rich Preston pants and shorts. The Preston pants and shorts are only available in a variety of solid colors, but solid doesn’t mean plain and boring. The detailed stitching on the back pockets gives them a touch of swagger without being over the top. Sligo pants and shorts fit true to size and have a just the right amount of stretch for added comfort. The light weight technical fabric performs well in a variety of conditions and is low maintenance. Another big trend in golf style is colored belts. White belts may have jumped the shark, but colored belts are hot right now. Sligo has been at the forefront of this trend for several years, and it is easy to see why. Their vibrant array of colorful belts will add more than a little pop to your waistline. 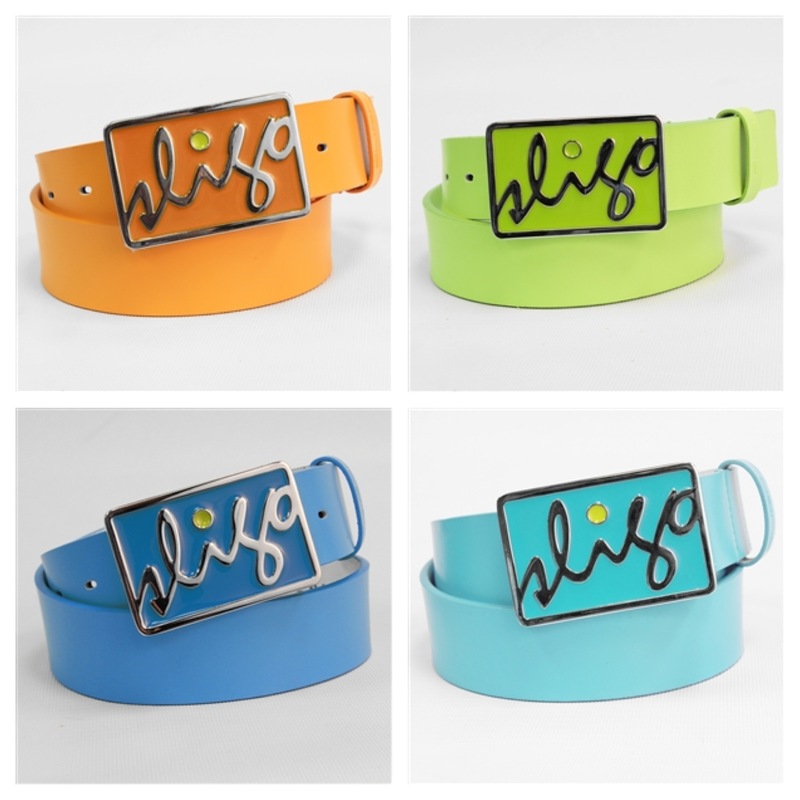 Add a pop of color this season with Sligo belts. 2013 is shaping up to be a big year for Sligo Wear. They have a killer collection of apparel and their PGA Tour ambassadors are off to a fast start. Long-time Sligo loyalist, Brian Gay, notched his fourth career PGA Tour win at the Humana Challenge in January and young gun Graham DeLaet has made habit of appearing on leaderboards this year. For more on Sligo Wear check out their website and follow them on Twitter, Facebook and Instagram. They are very active in the social media world. Sligo Wear apparel is also sold on the web through Fairway Styles.